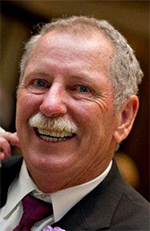 Ronnie Wayne McGhee, 64, died peacefully on Sunday March 9, 2014. Born in Vance County, he was son of the late Mozelle Stroud McGhee and Connie Lee McGhee. Ronnie, a loving husband, father and friend, graduated from Aycock High School in Vance County, was a veteran of the U. S. Air Force and retired from U. S. Postal Service. An avid lover of golf, he spent years employed at Green Hill Country Club in Louisburg. Ronnie is survived by his wife, Jan; two children, Addie Armstrong and husband Mike of Wake Forest, Nathan Walker and wife Andrea of Raleigh; brother, Calvin McGhee and wife Deborah of Henderson; mother-in-law, Jeanette Poythress of Henderson; grandchildren, Lily and Camden Armstrong; numerous cousins, nieces and nephews. He also leaves behind his beloved dog, Bella. Please call Southern Seeds by Monday April 14th at 1-800-682-1102; so we can make adequate accommodations or use E-vite to inform us that you are coming, but do not use both. ENCTA started off the year with our annual pesticide conference at Wayne Community College. The meeting was sponsored by Green Resource, one of our platinum sponsors. Rob Woods hosted the meeting that included 3 hours of pesticide credits, 1 hour of aquatic credit and .40 GCSAA educational credits. The lunch was great as well; it was catered by McCall’s Bar-B-Q & Seafood out of Goldsboro. Special thanks goes to Ryan Stanley from Foster Lake and Pond Management, Joseph Roberts and Travis Gannon Ph. D both from NC State for their presentations. They did an excellent job. Jim Hoffman and Frank Fragale will host our March meeting at River Bend Country Club in New Bern. Peter Maybach from M & M Consulting will speak on “Understanding soil and water quality and how it affects your overall turf health”. Kyle Oakes will host our April meeting at Birchwood Country Club on April 17th. 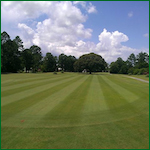 Lee Butler from NC State will speak on Diseases on Bentgrass and Bermudagrass greens. Lee’s presentation will give everyone an opportunity to learn about the most common diseases found in bentgrass and bermudagrass greens; they will learn the optimum fungicide selection, application method and timing for each of the common diseases; and will learn cultural management strategies that reduce pressure from each of the common diseases while reducing fungicide applications. Daniel Lancaster will host our fundraising tournament at Wedgewood Golf Course on May 15th in Wilson. The fundraising tournament will be sponsored by Cardinal Chemical, another one of our platinum sponsors. Please plan on joining us for this important event where the proceeds help support turfgrass research, scholarships and other aspects of the turf industry. I would like to thank all of our 2014 sponsors and the ENCTA board members for their continued efforts to ensure the success of the association. Please visit our website at www.encta.org and our Facebook page for more dates and information on our 2014 schedule. PLEASE CALL SOUTHERN SEEDS BY MONDAY, MARCH 17TH AT 1-800-682-1102, SO WE CAN MAKE ADEQUATE ACCOMMODATIONS OR USE E-VITE TO INFORM US THAT YOU ARE COMING, BUT DO NOT USE BOTH.